As regular followers will know, I can struggle to drag myself out of the confines of the NG1 postcode. Apparently all it takes is a free meal which manged to get me over to Gunthorpe. This free meal wasn’t one of the invitations sent by restaurants that I turn down on a weekly basis, just a friend who owed me one. The setting is pretty enough – somewhere between Southwell and Burton Joyce and next to the banks of the River Trent. I had been meaning to go for some time as its reputation for gastropubby brasserie food is good. It has relatively recently been refurbished inside and looks well for it, plenty of natural wood giving a light feel. The timing of our visit meant we took the option of an early bird menu (£22 for 3 courses), though on Monday and Tuesday it runs all the way to 9:30pm. There are 4/5 options for each course which is reasonable for a cut-price menu, there are however a few supplements for some dishes. Tandoori chicken terrine was the most appealing choice of starter, especially with the promise of a cauliflower bhaji accompanying it. Tom Browns is the sort of place where you aren’t going to be surprised when something arrives served on a slate. In this instance I actually didn’t have a problem with that, with colour provided from the yoghurt and golden mango chutney the dish looked quite inviting. Having looked forward to the bhaji I was left pretty disappointed, I got little cauliflower flavour and generally it was under seasoned. The terrine itself was ok, not quite enough tandoori spice maybe, but was a little odd in texture. Most terrines have a high fat content and this was mostly pressed chicken so ended up slightly dry and dense. 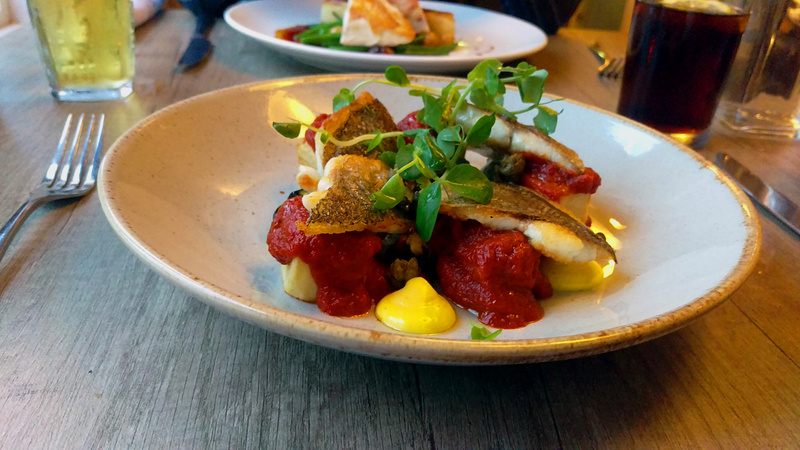 My main was sea bream with patatas bravas at a supplement of £3. It was a pretty plate and the fish was cooked well, well enough that it should have been paired simply to allow it to do its own talking. Sadly, the powerful tomato sauce and strong aioli, whilst traditional with the Spanish potatoes, really overpowered the rest of the dish. The starchy cubes themselves were woolly which didn’t create a pleasant texture in combination with the bream. 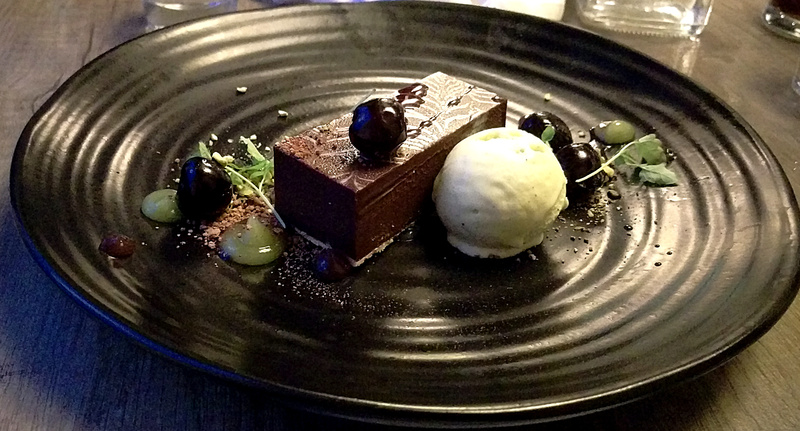 The only dessert that especially appealed was ‘rich chocolate tart’, and they rightly mention rich on the menu as it was a serious slab of condensed chocolate. I question whether it should even be called a tart, there was no outer crust and you had to squint to see the pastry of the base. It was accompanied with pistachio ice cream and Morello cherries. These two flavours, left to their own devices wouldn’t have been bad with the luxurious chocolate. That wasn’t quite the case though as some muted green blobs also appeared on the plate, myself and my fellow diner had a taste and mused on what it was. Upon asking the waitress it turned out to be pistachio gel. Whatever had been added to the nut had taken away the main taste and what was left was a bit chemically and added nothing to the dessert. That last experience summed Tom Browns up for me. I was frustrated at their need to over-engineer. There was no doubt that culinary skill and technique exists here and my meal was close to being very nice. Service did also suffer a little later in the evening as we struggled to get attention having been seated on the fringes of the dining room. If this restaurant was in the city centre I think these faults, though sometimes relatively subtle, might see it suffer amongst the strong competition. That said in the middle-class corners of Nottinghamshire they have a captive market and will continue to do well.